Panoramic Ocean Views, Custom modern home, lots of glass & patio areas, 4000 sq.ft., 5BR, 2.5 BA, 3 Fireplaces, 10 minute walk to beach or 1 min Drive, 5 miles to Downtown Santa Barbara's fabulous shopping and award winning eateries. This is a Southern California Dream Home! Rent by the weeend, week or month. Fully furnished. Fully-Equipped kitchen with 2 ovens. Outdoor dining areas and gas grill. Spacious tall ceilings, lots of glass and ocean views...Serene gated backyard with rose garden is perfect for relaxing. Indoor Sauna in Master Bath and Outdoor Hot tub on balcony facing the spectacular ocean view! Amenities: Indoor Jacuzzi tub, Indoor Sauna in Master Suite, BBQ, 3 Fireplaces, Modern equipped kitchen: Sub-Zero Fridge, Dishwasher, 2 Ovens, Microwave, Patios and Outdoor areas with Garden, 10 min walk to beach or 1 min drive, Free parking at local beach. This sleepy beach town is 10 minutes to downtown Santa Barbara - boating, swimming, kayaking, fine restaurants, antique hunting, 25 min to Santa Ynez wine country, 1+1/2 hrs to Los Angeles Theme Parks, Museums, Universal Studios, Disneyland and more! Check in is at 2pm / Check out is at 10 am- I can be a little flexible with this when possible! Expansive, breathtaking ocean views. 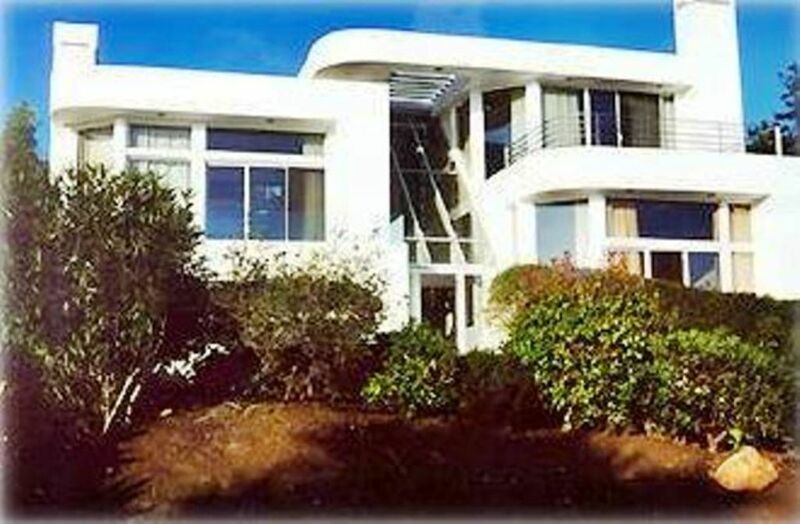 House has 3 level glass atrium with clear view of ocean and islands. Floor to ceiling windows let in lots of natural light. Use of house phone if needed. Plenty of Extra Linens too! Parking for 3 cars in driveway and more parking on street. Dead end street with little traffic. Help yourself to anything you find! Fully stocked. Sets of dishes and glassware galore! Kitchen is fully stocked. Plenty of plates and mugs! It is part of the family room and opens to a Ocean View patio. Family room, Den and Master Bedroom. Lawn and Rose Garden in gated backyard. 1-Off Living Room 1-Off Master Bedroom with seating and lounge chairs Patio with Dining table and seating area ALL face the panoramic ocean view. Small - (1-2persons) infra-red sauna in Master Bathroom. Great stay at this beautiful mansion by the beach! This place was enormous and wonderful! We comfortably slept 8, with no one having to sleep on a couch or share a bed. The place was clean! The decor and technology was a bit outdated, but other than that I have no complaints! The view of the ocean is spectacular and it is very quiet! The porch is a great place to watch the sunset or sunrise. I would definitely go back! This was really comfortable for 10 people and the house had everything we needed like toiletries and kitchen stuff. No problems! Nice view in a quiet neighborhood. Andrea’s modern style home was perfect for our family. The view from any of the three decks was terrific. Master suite spacious. Easy access to a beach, freeway, etc. Santa Barbara a few minutes away. Andrea was very responsive to any questions we had. Beautiful view. Multiple balconies and living rooms. One large master suite, but other bedrooms and bathrooms are very small. It's built into the hill so lots of stairs. Den is not enclosed. Flooring and furnishings are old and worn. The view is stunning. There are great places for a group of people to hang out both inside and outside. The town down the hill is cute, and Santa Barbara is not too far away by car. Andrea, the owner, is kind. Beautiful home in amazing location. We were 9 college friends who try to find a place for a reunion with warm weather. We couldn't have been happier with our accommodations. The kitchen was well stocked; there were multiple outdoor areas; sleeping arrangements worked well and the weather was perfect. What more could we want? We all agreed we want to do this again. Great shopping, classic dining and celebrity spottings on Coast Village Road or Upper Village of Montecito - just 1 mi from house. away!!! 4 Seasons Biltmore Hotel & Butterfly Beach 2 miles from house. You will have it all from casual to luxury - your preference!